“My abstract work springs both from meditations on nature and from childhood memories that are distilled into single dramatic moments. The energetic surfaces imply an ongoing tension between freedom and containment, edging the viewer closer to that place where chaos can erupt into clarity. 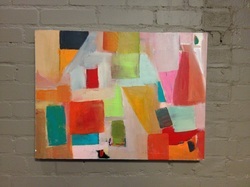 Come see her work showing at LexMedia through February 2013.